Vacation rental condominium. Sleeps 8, 3 bedrooms, 2 bathrooms. No pets allowed. A lovely three bedroom, two bath condominium; newly constructed with all new furnishings and appliances. 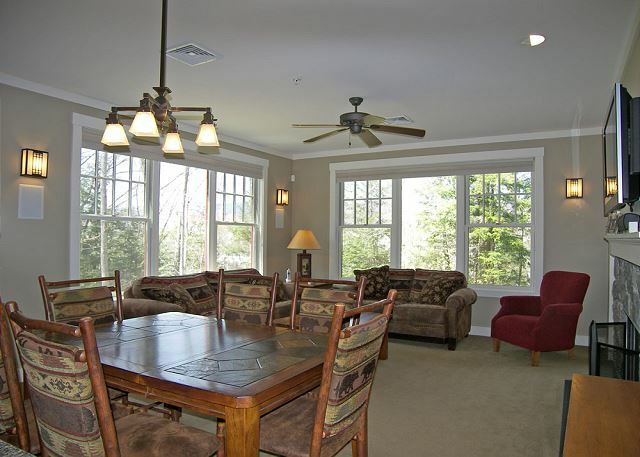 This condominium is located near downtown Lincoln and close to Loon Mountain Ski Area's new South Peak trail system. Enter this vacation home to the open concept kitchen, dining and living area. 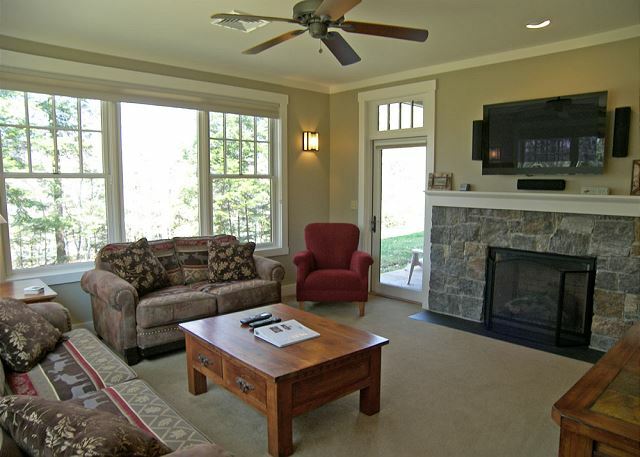 Relax and enjoy the large flat screen TV and gas fireplace that starts with just the flip of a switch. Off the living area is the master bedroom with with queen bed, a television and large master bath including his and hers sinks, stand-alone shower and separate tub. Down a short hall are the remaining two bedrooms (one with a queen bed and the second with two sets of bunk beds) and a full shared bath. 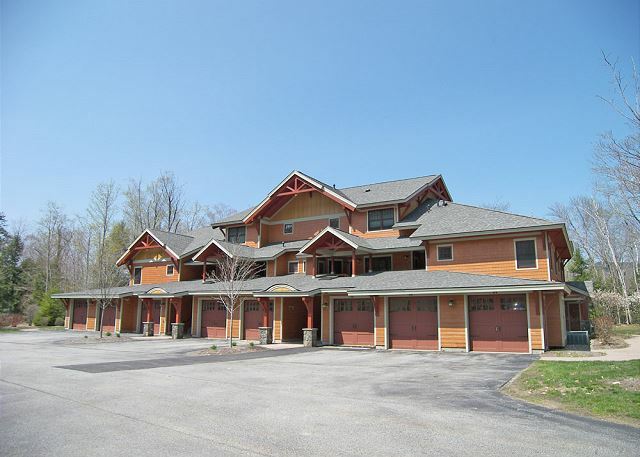 This condominium, South Peak Resort 1A, offers membership to the Mountain Club on Loon Swim and Fitness Center offering an indoor pool, outdoor pool, outdoor Jacuzzi, sauna, and exercise room. Access to the South Peak Community Outdoor Hot Tub and Fire Pit. Please note grilling is not allowed on South Peak Resort Decks or Patios. Grilling is allowed only on the community gas grill located near the South Peak outdoor hot tub. No personal grills are allowed. We had a great time at this unit. It was very well kept and in a convenient location. There was plenty of space for my husband and I and our three children (ages 8,6,and 3) and my parents to stay. The Condo was well cared for. Relaxed and Homey. The four of us enjoyed coming back home after hiking and trail riding. The rental agents were welcoming. I would definitely go back. We came up for a weekend getaway. The condo was very nice! The location was great. Near the restaurants and shopping, but set back enough to hear the river going by outside. We would definitely stay here again. Great time at a great place! We thoroughly enjoyed our stay at South Peak 1A! The place was super clean and easily accessible. We were very comfortable. 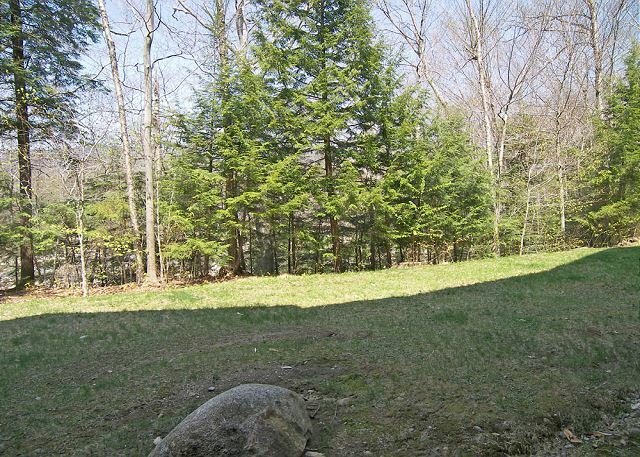 The location is conveniently located close to everything the Loon Mtn. area has to offer. We would certainly stay here again and would recommend this place to those in search! Nice one floor unit in good location. Beautiful property. Only issue was it had snowed and the unit was not shoveled out. Had to climb through high snow to get in. Excellent condo and location! Perfect for a late September trip with the kids and close to everything in Lincoln and Woodstock. A quick drive to Loon to enjoy the indoor and outdoor pool and all Loon has to offer. It was really nice to find a condo complex that was new and updated, very nice. Will definitely stay at South Peak again! unit was very convenient to the games and the stores. we were told there was no overflow parking for unit when in fact there was and it was stated in paperwork. was told to park third car in shopping center lot. We had a great stay at South Peak. The skiers loved how close we were to Loon and being able to ski down the escape route and walk home at the end of the day. The non-skiers loved the fireplace and how close we were to snowshoeing tails. The rental office was very helpful, they were able to get us lift tickets at a discount, gave us info on where to get the best deal on snowshoes and gave us a later check out so we could ski most of the day. We would definitely come back again. I bet it's beautiful in the summer! As always, a wonderful experience. South Peak units are great. Everything was very good as usual. The second time we've stayed in this unit but we've been to South Peak numerous times. Beautiful, clean condo in a fabulous location, close to town and the ski hill. 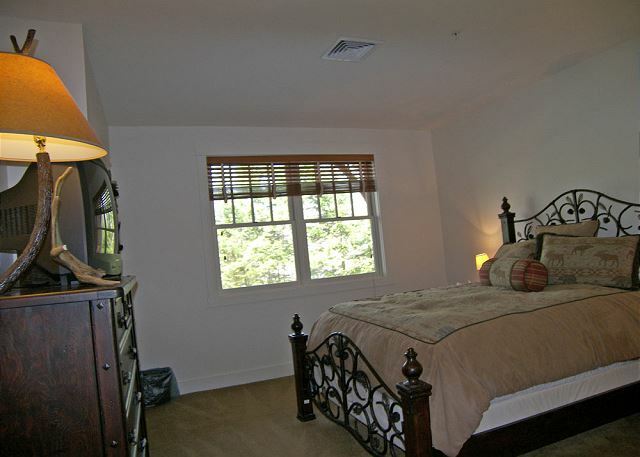 Bed in master bedroom could use a new mattress and linens, otherwise an excellent choice for a rental condo. We had a wonderful time at our South Peak rental in February. The house was perfect for our family. The house was very clean, roomy and had everything we needed for our ski weekend stay. Our two young children loved the bunk beds and the club pool access and the gas fireplace was an adult favorite. The Loon reservation services were incredibly accommodating and helpful when we called. We loved this rental so much we plan to return next year! We have stayed here several times. It is always enjoyable. 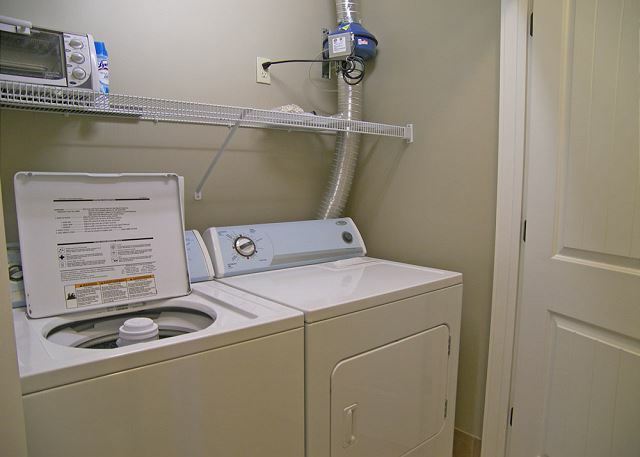 The condo is modern, has comfortable furnishings and is very clean. It has everything you need. It is close to the ski slope, has shuttle service if needed and is close to shop and restaurants. It is spacious and accommodates 6 people very comfortably . It comes with access to the Mountain Club which came in handy on one very rainy day. The price is reasonable. Our family weekend away as a Christmas gift to our kids was fabulous! 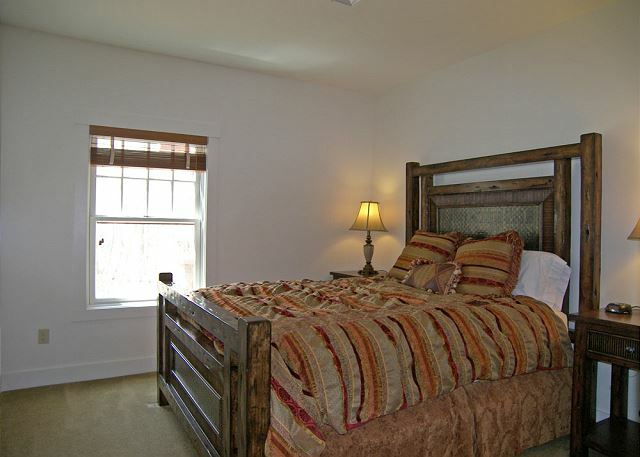 Everything from the cozy gas fireplace to the beautiful rustic bedroom furniture! The Kitchen was moderately well equipped and just loved the large granite counters with stools all around! Lots of room for the 6 of us! Also loved the fireplace and jacuzzi on the property, only wish it was right next door! We went snowboarding and loved that we could ride practically right to the door! Would definitely rent again! Fabulous condo! Loved the moose and outdoor themes. Very comfortable beds. Loved the kids room that slept 4 in bunk beds. Very clean. We have stayed at this condo before and as always everything was great. It is very clean, bright and spacious . It has all the necessities and feels like home. We're glad that you enjoyed your stay again! thought there is a swimming pool. But there is not. Perfect for our family we had a blast! We're glad to read that you had enjoyed this home so much! The condo was in great condition. Very clean, good features and a great location. We would certainly stay there on future trips to Lincoln. We would be very happy to see you again! The home was in great condition and was very clean and neat. We enjoyed the trail and creek on the premises. We're happy to hear that you had a great time! We have stayed in this property before and have been very happy with the accommodations. It is close to everything, the condo is large and comfortable. We hope to return again. We would love to see you back! The home is beautiful, everything is picture perfect, you really don't even have to leave the house . we took up family from new jersey that never been there before and they love the state and towns we went to. The water is so clean u want to drink from it but u cant, they enjoyed swimming and walking in it. We love it so much we stayed till Monday, so a four day weekend, Thank You John M.
Had a great time, property looked amazing and service was brilliant. We have been coming to loon for the past 10 years and stayed at this condo twice. First time few years back when it was just build. For the most part it was a nice stay. We had a few problems with the toilet in master bedroom and the alarm coming on and off. But in all it is a very nice property for two families with kids: very clean and well equipped. We just loved this condo unit. It was beautiful,very clean and spacious for 4 adults and two teens. A perfect location in Lincoln and very close to the Loon mountain club resort. South Peak is definitely a great addition to the area; this is an outstanding property and location with great access to entire White Mountains area, while still having a feeling of seclusion and privacy ; unit was very clean and tastefully furnished with new furniture and appliances; having an end unit made it especially nice and quiet; overall we were really pleased, especially since we reserved relatively late; only question was the lone hot tub located at the other end of the complex that seemed to be locked up and out of use; it would also be nice to have some kind of facility for cooking out. My family and I had a wonderful ski weekend. The condo and all the amenities were a+. We recommend it fully. Brand new. Looked like it was never lived in and tastefully decorated. Great location, exceptional property, Loon Reservation is keeping up it's fine work.We'll be back again. 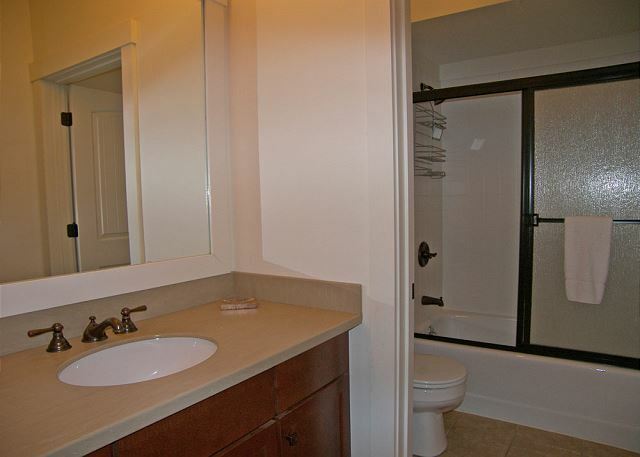 I loved the location of this condo and the fact that it was new and clean. I would have liked it even better if the pool and spa facilities were on site. Hopefully this is part of South Peak's long range plans. This was by far the nicest place I have ever stayed at.